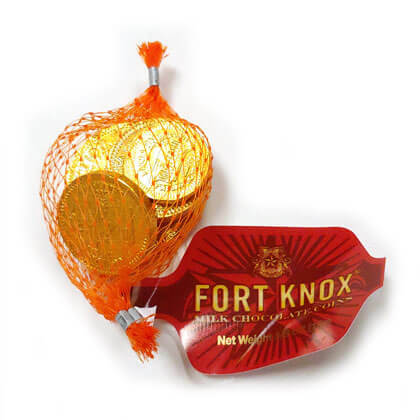 Milk chocolate gold foil wrapped coins in mesh bag. Each bags has 1 large (1.5 inches), 3 medium (1 inch) and 2 small size coin (.75 inches). Imported from Holland by Ft. Knox. OU Kosher Dairy. Net weight .625 oz. One mesh bag per order.